After you teach the skill in your lesson, it’s time to practice and progress! This is a handout I just made for our Instructors in Training about the difference between Practice & Progression, and Activities & Games. 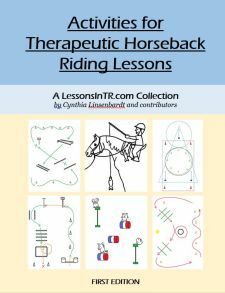 The practice is where the rider focuses only on the skill without distraction by games or activities, so they can really “get it” before moving on to using the skill in more complicated situations and multi-tasking. It is usually best to start at the halt and practice applying the aids without the horse’s added movement. Then practice the skill somewhere in the arena, such as at the walk on the rail, between cones, or over poles. Not all riders need much practice. A more experience rider may go straight to using the skill in an activity. Not all riders have the best attention span, so you may need to use props, or the goal of the activity to motivate them. Ex) 2 point at the halt; steering circles on the rail, etc. 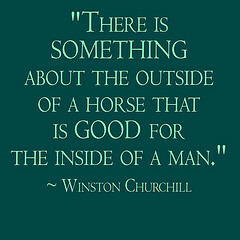 The progression is when we change something to help our riders be more independent and reach their goals. The activity lets the rider practice their skill in an engaging and motivating environment that often requires multiple riding skills to be used and includes other social interactions and problem solving skills. The activity must reinforce the objective & skill of the lesson. The activity should be meaningful. Use what will most motivate the rider and keep their attention. The activity must be age appropriate. Young kids will probably like games more than advanced/older riders. You will need to direct them how to begin – Who goes first? All at once or one at a time? How much assistance? Plan for what obstacles/props you need and set up the arena before the lesson. If during the lesson you realize you forgot something, DON’T leave the arena to get it, but ask a volunteer to get it. Incorporate praise, correction, and progression into the activity as well! Note: At the certification you will probably only have time to do the Practice and maybe Progression. Don’t get preoccupied with an Activity.